Beware of things lurking when out for a carefree stroll in the veld. Outside Mapungubwe in October 2013 I spotted a male lion running free on the tar road. As I got closer he ducked under a little bush. Amazing how I would never have spotted him had I not seen him dive under it! 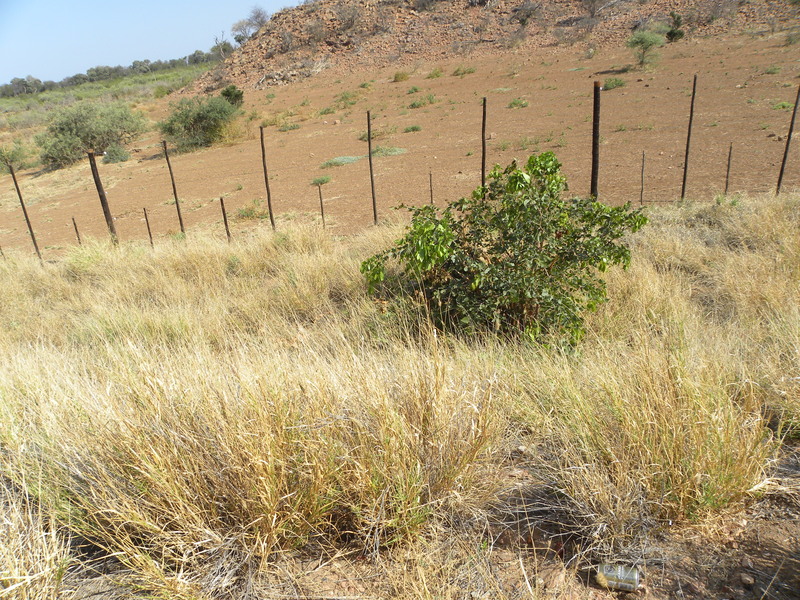 The can in the foreground of this picture is on the edge of the tar road, the bush is at the bottom of a steep little bank – about 3m down. He’s there, believe me! A full-grown lion is under that little bush. A short while later he bolted and ran along the fence in the opposite direction to where I was going on my way to Limpopo-Lipadi in Botswana. I was too slow with my phone camera. Hau, that one he makes us laugh! I had the camp to myself and prepared an elaborate bachelor’s supper, mainly liquid: A Black Label beer, then a couple G&T’s with ice & lemon, biltong, crisps and tomato sarmies. Made with old-style slice-it-yourself white bread. Next morning the ants had tried to hijack a stick of biltong, but had only moved it about 40cm. A few thousand of them put a thin stick on their backs for a getaway, but they were too slow. Later I checked out the Drifters mobile safaris camp. What a special site, ensconced in the rocky hillside among huge boulders! Interesting sights were an ele looking tiny next to a baobab and a giraffe looking short next to a massive free-standing boulder, miniaturising these large beasts. twenty five old conneko's - beautiful. bush now when I see how little cover a big male lion needs!